A description of the parish of Sancreed, taken from Joseph Polsue's complete parochial history of the county of Cornwall; published by William Lake, of Truro & John Camden Hotten, of London: 1867–72. This history is in four volumes copies of which can be found in the Local Studies Library, Redruth and at the Morrab Library, Penzance. "Sancreed is situated in the deanery and hundred of Penwith; it is bounded on the north by S. Just; on the east by Madron; on the south by Paul; and on the west by Buryan. The estimated tithable lands of the parish amount to 4600A. 1R. 6P., which are thus subdivided, - arable, 2900A. 1R. 6P., furze land, 1100A. ; commons 600A. The living is a vicarage in the patronage of the Dean and Chapter of Exeter, who are also the appropriators. The tithes were commuted in 1839 at £522 12s. 8d.,—namely, to the vicar £352 12s. 8d., and to the appropriators £170. The rectorial tithes of the manor of Gwidden, and of the tenements of Newham and Trerice, belong to the vicar. The glebe measure 152A. 1R. 8P. The parish contains by actual measurement 4471A. 0R. 13P., of which the public roads measure 47A. 1R. 36P. Vicars:—James John, rector in 1536; Nicholas Fleming, 1704 ; Thomas Sandford, ob. 1736; Edward Hobbs, vicar 36 years, ob. 1772; George-Pender Scobell, 1772; William Stabback; Henry Comyn, A.M., Oct. 13, 1837; and the present vicar, the Rev. John-Martyn Collyns, instituted in 1851. The church, which is dedicated to S. Sancredus, comprises a chancel, nave, south aisle and north transept. The arcade consists of five four-centred arches supported on monolith granite pillars; the transept is separated from the nave by two similar arches, sustained by a similar pillar. The inner half of the transept is used as a vestry; in it are preserved two large pieces of framed woodwork, together about 17 feet in length, which comprise several curiously carved panels of the ancient screen, displaying various symbolical figures. The font is ornamented with four angels, having crosses on their foreheads, and bearing shields. The tower arch has a plain soffit. The entrances are a south porch, in which there is a stoup, and a niche over the inner arch; a north door; and a vestry door; the original priest’s door is blocked. The tower is a massive building of two stages, and finished with battlements and pinnacles; it contains three bells. Underneath lies interred the body of the Reverend Thomas Sandford, late vicar of this church, who died the 16th day of Septr., 1736. Here lie the remains of the Revd. Edward Hobbs,, who was vicar of this church 36 years. He was of examplary virtue, piety, and integrity; and his resignation under a long and painful illness shewed him to be a good man and the Christian. He died the 16th day of Novr., 1772; aged 68 years, Also the body of Ursula Hobbs, widow of the above named Edward Hobbs, who departed this life on the 6th day of February, 1786; aged 77 years. This place is sacred to the memory of William Richards, late of Trevean in this parish, who died 9th June, 1797; aged 64. Also Mary his wife, who died 22nd Novr., 1789; aged 52. Sacred to the memory of Anna Maria Bird, widow of Samuel Bird, of Ridgeway in the county of Devon, Esqr. She died the 8th day of April, 1803; aged 40 years. Her body is deposited in a vault with the remains of her relatives, Josiah Lanyon, Esqr, and Jane his sister. Sacred to the memory of Edward Scobell, Esq., of Poltair in this county, a post captain in the Royal Navy, who died April l7th, 1825; aged 41. Occuping his business in great waters he saw the wonders of the Lord, and served him with reverence. Yet that God, whose the sea is, and he made it, hath turned the floods into a wilderness, and called him early away to the city of the silent. Thus has the grave one example more of the mysteries of Providence, and to the living is repeated the awful lesson,—that the race is not to the swift, nor the battle to the strong. That firm principles and active piety are no safe-guards from the vicissitudes of our lot; that youth shall faint, and the young men fall; but they that wait upon the Lord shall renew their strength, and mount up on wings as eagles, in that great day when the virtuous attachments of life shall be restored, and they who huve sown in tears shall reap in joy. Sacred to the memory of the Rev. Henry Comyn, M.A., for nearly 14 years vicar of this parish. He departed this life in the faith and hope of the Gospel, beloved and lamented, on the 30th July, 1851; aged 76. 1 Cor. xv. 55. In memory of Rachel Gwavas, daughter of Philip and Anna Marrack, of Tregonebris in this parish, who departed this life on the 24th of February, 1849; aged 22 years. Them also which sleep in Jesus till God bring with him, 1 Thess. iv. 14. In memory of a beloved daughter, Philadelphia Comyn, who fell asleep in Jesus on the 19th of July, 1847; aged 32 years. 1 Cor. xv. 57. 2 Tim. 1. 10. To the memory of Thomas Scobell, Esqr., who died the 22nd Febry., 1852; youngest son of the Revd. G. Pender Scobell, formerly vicar of Sancreed and St. Just. This tablet is raised by his bereaved widow as a token of affection. In the taxation of pope Nicholas, began in 1288, this church is denominated Eccl’ia S’o’i Sancredi. Near the south porch of the church is an ancient granite cross, about 7 feet high; on it are a sculptured effigy of the Saviour, and a fleur-de-lis the emblem of the virgin Mary. There is another cross, apparently still more ancient, near the west gate of the churchyard, This parish abounds with antique religious and sepulchral monuments. At Drift there are an ancient cross, and two rugged, upright, monumental stones, about 18 feet apart; one is 9 feet above ground, the other about 7. About a furlong to the north of these, on Trenuggo, is another stone monument, which measures 4 feet above ground, and 2¼ wide, on the upper part of each of its sides is a Roman cross, supposed to have been sculptured subsequent to its erection. One of the crosses inclines to one side. About a mile from drift, adjoing the north side of the Land’s End road, is the largest stone monument or menhir in this part of the county. It is 11 feet in height, about 6½ wide, at its lower part, and 1½ thick with smooth sides; this granite pillar is on Tregonebris. At Boswens, on the northern sido of the parish, is another granite menhir; it rises out of a cairn to the height of about 8 feet. Caer Bran Castle, i.e. Brennus’s Castle, or the Crow castle, stands on the summit of a hill six furlongs and a half to the west of the church; it consists, or rather consisted, of three concentric circles, the greatest being about 240 feet in diameter, and still in some places 15 feet in height; it is composed of earth, and, as is usual in such cases, has a ditch on each side. The middle circle was built of stone, and was at least 12 feet in thickness; a large portion of the stone has been removed for building purposes. The innermost circle is about 30 feet in diameter, and was evidently a sort of citadel. About a quarter of a mile north of Higher Bodennar are the remains of an ancient dwelling place called the Crellas; they consist of two low walls the outside one being about 50 feet in diameter, and the area enclosed by the two walls is about 41 feet by 36 feet; the lesser circle, which is attached to the circumference of the largest is 18 feet in diameter, and opens only into the main building; the whole structure has an entrance from the south. Near the Crellas was formerly an artificial cave or underground gallery called the Giant’s Hill it was in a dilapidated condition in Borlase’s days, and is now completely destroyed. On the top of Botrea Hill, on Trannack Downs, are the remains of four barrows, arranged in a line north and south; in 1826 an urn was found in the largest of these tumuli, protected by a Kistvaen. It was about a foot in diameter, and contained black earth mixed with ashes and charred wood. In another barrow were found the remains of a Kistvaen and two flint arrow-heads. Borlase gives a sketch of another urn found in this parish, which he supposed to be of Roman origin, On Trennack Downs is the site of an ancient castle. The sites of three ancient chapels are still known, namely, Chapel Uny in the village of Brahan; another in Bosence; and the third on Chapel Downs. Of Chapel Uny a few wrought stones, portions of elliptical and segmental arches, alone remain. Bosence Chapel is situated between Bosence and Botrea; its walls, in some places are nearly 7 feet in height; it measures internally 23 feet by 12; and it, stands due east and west; built into an adjoining hedge may be seen a portion of window tracery wrought in a solid piece of granite. The third chape1 locally termed a “well chapel,” appears to have been an ancient baptistry. Internally it measures 14 feet by 6½ feet, and is partly built over a well; pieces of wrought stone, including a solid semi-circular stone arch, are built into a neighbouring hedge. Near Chapel Uny is an “holy well” known as S. Euny’s Well, and traditionally celebrated for the miraculous cures performed by its waters. In 1860 a singular gallery, roofed and paved with slabs of granite, was opened near the ancient village of Chapel Uny. About a quarter of a mile to the south of this cave is an ancient barrow; it measures about 9 feet in height and 15 in diameter; it covers a kistvaen 6 feet in length by 4¼in breadth, one end of which has been open for more than half a century. Driff or Drift was the ancient seat of the family of Trewren;—“Dryffe“ wrote Norden in 1584, “The howse of Thomas Tre-wryn.” This family was settled here so early as 1340; its representatives married the heiress of Tresowis, and coheiresses of Roscarrock, Archer, Trevroneck, Chiverton, and Prisk; they removed from this p[il]ace to Trewardreva, Constantine. The Trewren arms are—Azure, 3 bezants 2 and 1. Drift was sold by the last of the Trewrens in the latter part of the last century, and is now the property of the representatives of Messrs. Marrack and Harvey. The manor of Tregonebris, the only known manor in the parish, was inherited by the Bullers from Ezekiel Grosse. The barton, formerly a seat of a younger branch of the Lanyons until the latter part of the last century, and the manor, are now the property of Thomas-Bedford Bolitho, Esq. Bosvennen anciently claimed manorial rights; temp. Edward IV. it belonged to the family of Phelip; it is now the property of Lord Robartes. The barton of Botrea is the property of the Usticke family; and the barton of Sellan late the property of the Praed family, has been purchased by Edward Bolitho, Esq. The principal villages are the Churchtown, Drift, Sellan, Brahan, and Newbridge. There are Wesleyan Methodist chapels at the Churchtown and Newbridge; and Bible Christian chapels at Drift, Newbridge, Brahan, and Grumbler. Among the landowners are Lords Falmouth and Robartes; the representatives of the late Mrs. Hartley; Messrs. W. Rashleigh, the Bolithos, and the representatives of the families of Scobell, Tremenheere, and Borlase. The dedication feast is celebrated at Whitsuntide. 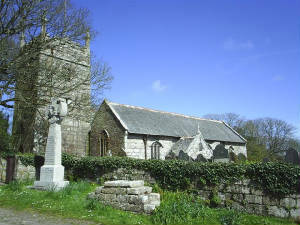 The parish, the only one west of Hayle that does not border on the sea, is wholly situated on granite.